Just finally figured out a way to convert Ustream FLV files to MP4 without re-compression. It basically just fixes the A/V sync and switches the container of the file to mp4. – Open the free app called “Avidemux 2.6”. – Change the “audio output – shift” to “80” ms.
– Then select the “Output Format” – “MP4v2 Muxer”. – Then I set the “Selection” to cut the beginning and end by around 5 seconds. ..:: CLICK FOR FULL SIZE IMAGE ::.. Took me forever to figure this out. VLC, Yamb, and other apps don’t really work properly. 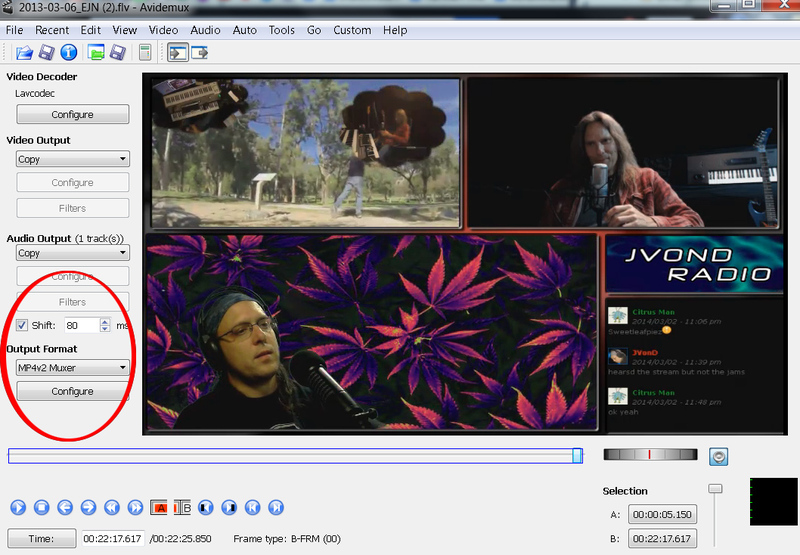 If you still have issues then try and switch the “Video Output” to Mpeg4 AVC to re-encode the video. This is the only thing I could figure out after countless hours of trial and error. Hope it helps!